Learn how to field strip your 1911 for easy cleaning and lubing after a range day. 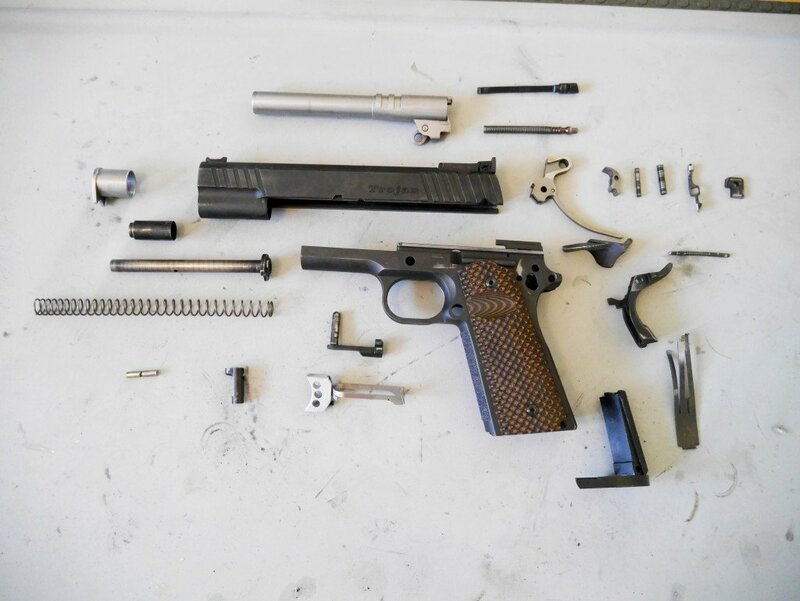 We’ll also go over how to completely disassemble your 1911 for those deep cleaning sessions. Field stripping is disassembling your gun into it’s primary components for routine cleaning and maintenance. The 1911 is slightly harder to field strip than other pistols, but can still be done in no time. Before we go into cleaning specifically for the 1911, you might want to first check out our primer on How to Clean and Lubricate a Gun. We also recommend the following tools and solvents/lube for cleaning our 1911 and other guns. Here is a great video that goes over all the essentials of field stripping, cleaning, and lubing the 1911. We like how he puts grease on the rails like us and he also goes over the often forgotten magazines! We like to keep our 1911’s in tip top shape so we field strip and clean every 2-300 rounds. We also do a full disassembly cleaning plus copper solvent at around the 1,000 round mark. You’ll find that the extractor gets pretty dirty but the trigger mechanism stays nearly pristine. Here’s a great video of a detailed strip of the 1911. Spray everything down with some M-Pro 7 and put thin layer of oil on everything before putting it back together. That’s it to a happy 1911.